Activision has nixed the release of NASCAR 2011 in the U.K. but developer Eutechnyx says it's looking into other ways of getting the game to the fans. NASCAR. It conjures images of thick accents, southern states, rowdy crowds and good ol' boys turning left at 200 miles per hour. Not the sort of thing that's likely to go over big in the posh, cultured lands of the U.K., in other words, which is why it's no surprise that Activision has decided not to release NASCAR 2011 in Old Blighty. The game was originally expected to launch in the U.S. and U.K. but Activision confirmed with MCV yesterday that plans for the U.K. have been scrapped. But that's not necessarily the end of the tale, as Eutechnyx, the company developing the game, said it is looking into other options to get it to the U.K. market, including by making it region-free. "Ultimately, as the distributor, Activision makes the call on which territory the game will be released in," Eutechnyx's NASCAR Product Manager Gregg Baker told Eurogamer. "However, as a developer we can try and ensure that those wishing to purchase the game outside of the US are still given the opportunity." "We will look into making sure there is no region locking on the game so fans can import the game and if the demand is high enough we may even look into the possibility of distributing the game ourselves in the U.K.," he added. Many Xbox 360 and Wii games are region locked but a good number, including the Activision-published Call of Duty: Black Ops, are not. Furthermore, Activision can decline to release the game in the U.K. but it can't prevent Eutechnyx from making other plans; Eutechnyx holds the NASCAR license, while Activision is merely a "distribution partner." All of which leads me to ask: are there really NASCAR fans in the U.K.? 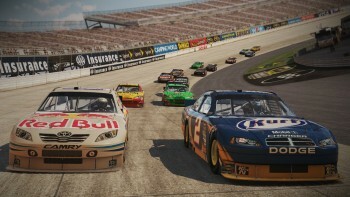 NASCAR 2011 comes out on March 29 for the Xbox 360, PlayStation 3 and Wii.